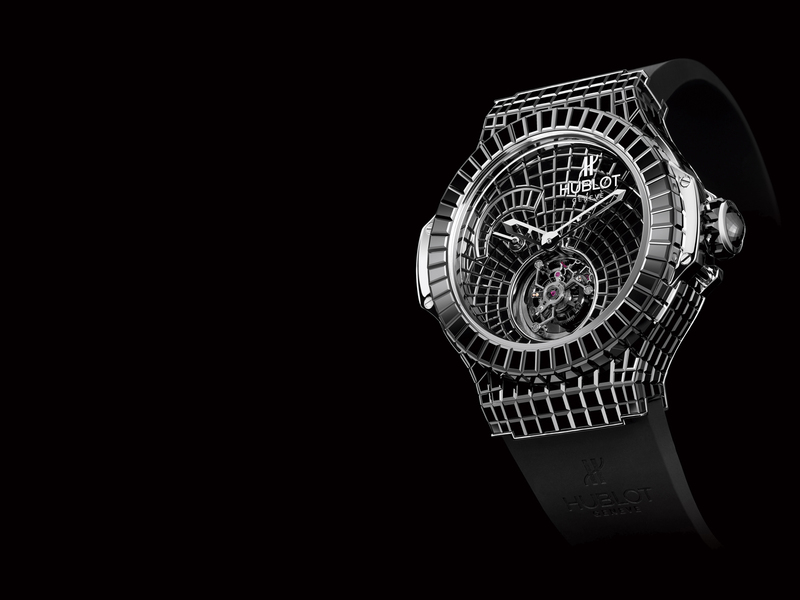 A few years back Hublot created somewhat of a sensation when they unveiled the One Million Dollar Black Caviar Bang, a stunning piece literally covered in almost 550 rare baguette cut black diamonds, 34.5 carats in total. The bold style combined with the exceptional amount of skill required to produce such a piece was enough to win Hublot the Jewelery watch award at the Grand Prix d’Horlogerie de Geneve in 2009. Now for Basel World 2011 this innovative manufacturer has come up with a novel way to offer the highly coveted design of the Million Dollar Black Caviar Bang at a far more achievable price point. Meet the Big Bang Black Caviar – in ceramic. As we hinted at above, the new Big Bang Black Caviar is made entirely from ceramic including the crown and dial, which is a first for Hublot. 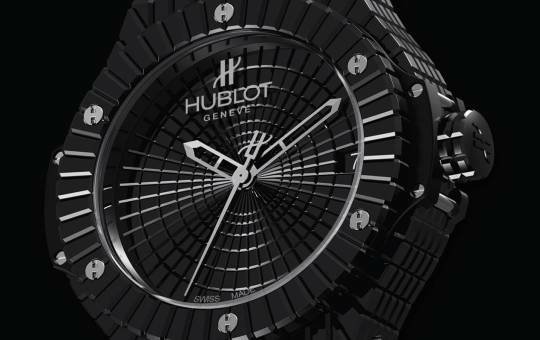 It’s not hard to see where it takes its striking style cues from and like its big sister the Big Bang Black Caviar is all about attracting attention, although according to Hublot it goes about this in a subtle way. The concept is “invisible visibility” – designed to blend in to the background but at the same time so dramatically different that one cannot help but stare. Adorned in uniform shades of black with its reliefs designed, cut, bevelled and polished like the baguette black diamonds of its namesake, it comes in a diameter of 41 mm and is equipped with the HUB1112 automatic mechanical movement complete with a date window at 3 o’clock. Rounding out the specifications are the 42-hour power reserve, and water resistance of 100 metres. Perhaps what is most refreshing however is that this really is a unique Big Bang at an accessible price point. Sure it takes its inspiration from a previous model but let’s be realistic, that model was just that, a model, one that was created and designed purely to showcase Hublot’s phenomenal talents and appreciation of beauty. Now with the release of the Big Bang Black Caviar, Hublot has managed to succeed where so many others have failed. They have created an iconic piece and then devised a way to make it accessible to a wider audience without detracting from the value of the original. The watch will be presented on a brilliant black “glossy” alligator strap stitched on black rubber, although for our money we’d also like to see what it looks like on one of Hublot’s trademark black rubber straps. Official pricing has not been released yet as far as we are aware, however expect it to be significantly less than $1 million. Probably closer to $10k – $15k we would expect. Like many of you out there we don’t always agree with Hublot’s approach when it comes to the Big Bang collection. Sometimes there are just only so many special editions that one can handle. Nonetheless one can’t help but be swept up by the brand’s energy and innovative spirit, driven undeniably by Hublot CEO Jean-Claude Biver. The Big Bang Black Caviar is no exception, and in fact in our opinion shows Hublot at its best, refusing to follow others and instead create its own path.